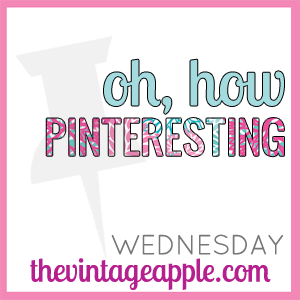 I am linking up with The Vintage Apple for my premiere "appearance" in the Oh How Pinteresting Wednesday! Enjoy my pins and hop over to The Vintage Apple for more! I don't know why this cupcake banner keeps showing up! No matter how I move the pictures around, it still stays right after the 2nd pic. It usually is at the end, after my signature, to separate blog posts. Anyone know? Regardless, awww, isn't he cute? I've already seen it twice this month. Love! Happy holidays Kimberly.